The cry is heard from the streets early each morning, in neighborhoods around this teeming West African city. from a stream in the Foret du Banco neighborhood outside Abidjan, Côte d'Ivoire. UMNS photos by Mike DuBose. It is a call for laundry. Out in the street, people who wash clothes for a living are pushing and pulling large, medieval-looking wooden carts on three wheels. The clothes washers are known as the “fanico,” meaning “cloth” in the Dioula language. 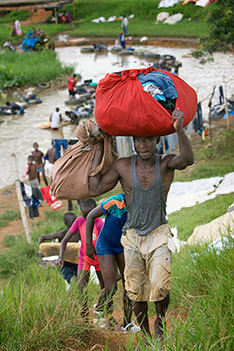 Customers in the neighborhood hand over their dirty laundry to the fanico, who pile the apparel in their carts and haul it off to a stream on the outskirts of Abidjan. At the end of the day, the fanico return to the neighborhoods with the clothes washed and sun-dried. The fanico themselves will make their way home in clothes that are damp and dirty from a long day of labor in the sun, mud and water. The work is hard, says Ibrahim Kansore, 28, a strapping man who stands over 6 feet. Why do they do it? “Because of poverty,” he says, speaking in French. Poverty is staggering in Côte d’Ivoire, and it is one of many big-issue problems challenging this country of 21 million people. About a fifth of the people live in Abidjan, the commercial capital, where contemporary structures stand next to buildings erected during the French colonial era, a half-century or more earlier. An air of stagnation hangs over many parts of town, where large numbers of young people walk the streets against a backdrop of fatigued-looking buildings and crumbling market stalls. In the thick of it all, The United Methodist Church is a powerful presence, sharing the gospel, operating schools, providing health care and offering ministries aimed at lifting people out of poverty. It was only five years ago when the Protestant Methodist Church of Cote d’Ivoire joined the United Methodist denomination, but in that time, it has immersed itself in the mission-critical areas of the larger church. It is developing leaders, trying to keep up with a membership that is growing as much as 8 percent annually. The Ivoirian church is also advancing global health, operating schools and providing other services. Overseeing the church is Bishop Benjamin Boni, a quiet man with an easygoing manner and a firm belief in prayer. With God in front and his church behind him, Boni is working to multiply his pastors—a group anchored by barely 100 ordained clergy—and help end what people refer to as Côte d’Ivoire’s crisis, a period of political instability exacerbated by civil war. After gaining its independence from France in 1960, the country enjoyed relative stability until a December 1999 coup d’etat by disgruntled soldiers. A year of shaky peace followed before the military ruler was deposed. The United Methodist Church's Adjame Primary School outside Abidjan. In 2002, soldiers sparked another rebellion, defying government plans for their demobilization. With the addition of other rebel groups, the uprising exploded into a five-year war. Peace agreements in July 2007 left the rebel Forces Nouvelles -- or New Forces – in control of the largely Muslim northern part of the country. Boni has gone into rebel-held areas as a member of the Forum of Religious Leaders, which includes Muslims as well as Catholics and Protestants. He was part of a delegation that met with rebel soldiers in the northern towns of Bouaké and Korhogo, and he has met with Blaise Compaoré, Burkina Faso’s president and facilitator of the peace process. “The church has always been involved, since its creation, in all the great steps of the history of this country,” he says. “So when the crisis started, the church was present to bring its message.” Through Boni’s personal involvement as well as the ministry of army chaplains and others, the church has been engaged throughout the peace process. In former rebel-held areas, many people have surrendered their lives to Jesus, and the church needs pastors to minister to them, Boni says. “The church is fast growing, and we give glory to God, but the question is how to have enough pastors for all the nation,” he says. With only about 109 pastors, the conference relies heavily on 6,000 local pastors, 7,000 class leaders and other laity to help guide the work of the church. The conference’s 700,000 members are part of a wider community of about 1 million people served by the denomination. Training more leaders is critical. The conference is developing a lay preachers program, a class leaders program and a children’s service program, says the Rev. Isaac Agre, president of the conference board of ordained ministry. Lack of financial resources is a problem. In 2008, 121 people applied for pastor training, but financial limitations meant only 20 could be chosen, Agre says. Training pastors takes about four years, and the church pays for everything, including food, he says. In addition, financial resources are needed to build churches and buy cars for pastors, as well as do the follow-up work necessary so a member can be “dynamic in his environment,” Agre says. Despite the challenges, Boni and his leaders are excited about the possibilities for evangelizing and growing The United Methodist Church. The conference is asking each church member to give 5 central African francs a day—approximately 1 U.S. penny—to support that work. The plan is to create investment opportunities that would fund the church’s evangelization program and the training of pastors and laity. “What brings all these people to this church is that The United Methodist Church is a well-structured denomination through which the word of God is preached,” says Georgette Assare Badjo, a women’s leader at Nazareth United Methodist Church in Yamoussoukro. The church has the delicate job of evangelizing in a country where up to a third of the people are Christian, one-third are Muslim and about one-fifth follow traditional African religions. water taxi outside the United Methodist church in Groguida, Côte d'Ivoire. “Generally speaking, The United Methodist Church is respected in this country,” Yoou notes. That respect is fed in part by the church’s involvement in education, health care and other services that improve people’s lives, he says. Villages with United Methodist churches usually have a church-related primary school. The church also operates health care facilities, most notably Dabou Methodist Hospital, and an orphanage in Dabou. Boni is part of the team for the denomination’s Global Health Initiative, which is focusing on malaria, AIDS and tuberculosis – the diseases of poverty. “The United Methodist Church of Côte d’Ivoire would like to see the strategy for stamping out the diseases of poverty as a reality,” says Yed Esaie Angoran, a member of Boni’s cabinet. In addressing poverty, the conference is encouraging every local congregation to embrace at least one income-generating project to create jobs and help the church. Some churches make and sell jam, soy milk, attiéké – a cassava-based dish – and other food items. to Alépé United Methodist Church. The Clef Sarepta – or Sarepta Key – microfinancing bank, founded by United Methodist women, provides small-business loans to help women become self-supporting. 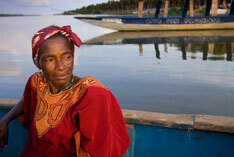 Ranatu Ibitowa, a women’s leader involved in the bank, describes it as a development organization inspired by God. “We put God ahead of everything,” she says. One of the next big steps for the conference will be the launch of a community radio station, which would provide the church with the means of tying together all of its ministries – evangelism, education, the provision of important information on health care and messages promoting peace. With the help of United Methodist Communications, Ginghamsburg United Methodist Church in Tipp City, Ohio, and the denomination’s Texas Conference, the radio station is expected to begin operation in Côte d’Ivoire this year. The move will enable the church to speak more powerfully to a national audience. meager living washing clothes in the stream. For Ibrahim Kansore and the other clothes washers, development can’t come soon enough. He came to Côte d’Ivoire from neighboring Burkina Faso about three years ago with his wife, drawn by the lure of a better economy. 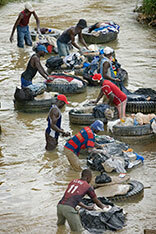 He is among about 100 people washing clothes in a stream that crosses under the highway west out of Abidjan. They scrub the clothes on flat boulders or in rubber tires, then spread them out to dry on the grass, rocks, bushes and guardrails. Thousands of shirts, skirts, pants and linens form a multicolored panorama stretching hundreds of yards along the roadside. Washing clothes is a difficult way to earn a living, Kansore says, explaining that he walks long distances and carries heavy loads. He makes about 50 central African francs per item, and can earn 5,000 to 6,000 cfa in a day – less than US$13. Though he has never met Bishop Boni, the young clothes washer would find he shares a common bond of faith with the United Methodist leader. Mired in the poverty of his adopted country, Kansore says his future is in the hands of the Lord. NOTE: Since the interviews were conducted for this story, Ivoirian officials have shut down the fanico operation, citing problems with water flow and flooding caused by the tires and blocks embedded in the stream. 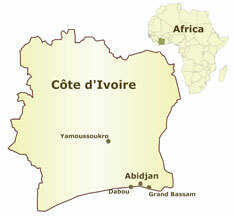 Authorities have said the fanico will be relocated to another area north of Abidjan.